Here’s the story that I ran in The Press today. after a few days hands on with Sony’s PS Vita. Since writing this I’ve just about completed launch title Uncharted: Golden Abyss and then will start on Wipeout 2048. Enjoy. When my review unit arrived for a few days hands-on, it came in a large briefcase carried with military precision by two burly security guards with name badges reading “Colin” and “Brian”. Brian, the more gruff of the two, removed his dark sunglasses and grunted what sounded like “Gidday, sign this” as he thrust a PlayStation-branded paper on a clipboard towards me. Colin just eyed me suspiciously. I signed the document and then Colin unlocked the handcuff on his left wrist, Brian the handcuff on his right one and, together, they handed me the case. “Don’t drop it or we’ll stop being so friendly,” muttered Brian, giving me what I assume was a smile. Then they left. In a small van. OK, I made the bit up about the two security guards but the Vita did arrive in a large metallic briefcase with a combination lock. In fact, when I opened the thing, the interior was so cavernous that I’m sure I heard the Vita complain of loneliness. Gone are the UMDs (Universal Media Discs) of the old PSP, replaced with a new proprietary flash memory card called the PS Vita card. Memory cards range in size from 4Gb to 32Gb. Checking a handful of sites for memory card prices revealed that the RRP for a 16Gb “official” PS Vita memory card, which will fit between four and eight full games, is around $85, so it might pay to shop around. Designwise, the Vita (it’s Italian for Life) improves on the original PSP in just about every way: It has two cameras (one forward facing, one rear facing, 0.3MP, 640 x 480 resolution), two thumb sticks and they’re proper thumb sticks not the “nub” type found on the original PSP two shoulder buttons, the PlayStation circle, square, X and triangle buttons, motion sensors, a D-pad and a PS Home button. The most noticeable feature, though, is the 5-inch OLED capacitive touch screen and it’s a beauty: It’s bright, clear and responsive. There’s also a touch-sensitive pad at the back. The user interface has changed, too. Gone is the cross media bar user interface used by the PSP and on the PlayStation 3, instead replaced with a series of bubble icons that wobble gently when you flick through each menu page. It’s surprisingly pleasant to look at and more organic than the more clinical-looking cross media menu system used on the PS3. While it’s not a smartphone, the PS Vita is embracing social media aspects, too, with a group messaging application that lets you instant message people on your PlayStation Network friends list, as well as an application called Near which lets you locate any other Vitas nearby obviously, I couldn’t test that function. Pressing the PS Home button takes you to a tabs page that shows all open applications. Press it again and you’re back at the menu screen with the application “bubbles”. The Vita is a gaming machine and while the demo unit didn’t come with any full games (just demos), late last week I got access to some full titles, including Uncharted: Golden Abyss, Wipeout 2048,ModNation Racers and Unit 13, so look out for full reviews soon. Of the demos, Escape Plan, looks interesting but perhaps the most innovative is Gravity Rush. You’ll be able to buy full games at retail stores or download them off Sony’s online network, weighing in at between 500Mb and 1Gb in size, although Uncharted Golden Abyss is around 3.5Gb in size. Perhaps the most high profile game is Uncharted: Golden Abyss, which sees hero Nathan Drake in his first portable outing, this time adventuring in the ruins and jungles of South America with a rogue general after his blood. It’s Naughty Dog’s PlayStation 3 series Uncharted gone mobile. I’m about 60 per cent of the way through the game so far and I have to say I’m incredibly impressed. While it might not always look as good as its PS3 counterpart, it really does capture the feel of the Uncharted series and shows just what the Vita is capable of in terms of visuals. Even my non-gamer wife was impressed. Having a second thumb stick means you can control the camera a huge benefit in an action game and the game makes the most of the front touch screen, too, letting you mimic on-screen prompts to do things like slash through cloth or bamboos using a machete or save Drake from a perilous fall. You can also use the touch screen to solve puzzles and the rear pad to climb ropes and paddle a canoe. Golden Abyss brings a love interest, the return of an old friend, shoot-outs, punch-ups and lots and lots of climbing, complete with crumbling handhelds. Wipeout 2048 is the classic PlayStation series given a visual makeover and it manages to capture the speed and thrill of previous versions nicely and Escape Plan is a black-and-white game where you have to guide a stick-figure as he tries to escape a labyrinthine facility. For me, gravity Rush is the game that intrigued me the most and the one that seems the most innovative on the Vita. It’s a gravity-bending action game featuring a female heroine, Kat, who has lost her memory, and a magical cat that gives her powers to manipulate the laws of gravity. Press the right shoulder button and our heroine floats above the ground. Point in the direction you want her to head, then press the shoulder button again and she’ll plummet to wherever she is pointed at. She can also hover mid-fall, walk up walls and perform flying attacks on enemies. I’m excited about the PS Vita: It’s an amazing piece of kit that really is a portable PlayStation built for playing games but Sony needs to market it right and convince today’s gamers that in an age of smartphones and i-devices where you can buy games for a handful of dollars, that a dedicated handheld gaming device is still warranted. If Sony can do that, and provide a must-have experience, then the Vita has a bright future indeed. 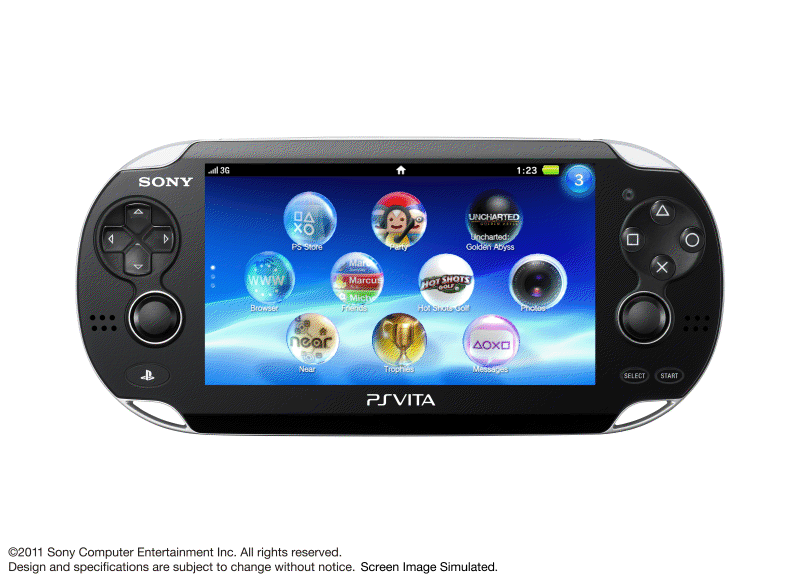 Sony’s PS Vita launches in New Zealand on February 23.